Malaria affects close to 500 million people every year, but we're not the only ones—different species of malaria parasite can infect birds, bats, and other mammals too. A Field Museum study published in Molecular Phylogenetics and Evolution reveals a new take on the evolution of different malaria species and contributes to the ongoing search for the origins of malaria in humans. "We can't begin to understand how malaria spread to humans until we understand its evolutionary history," explained lead author Holly Lutz, a Ph.D. candidate at Cornell University and a longtime affiliate of The Field Museum. "In learning about its past, we may be better able to understand the effects it has on us." Malaria is a parasitic single-celled organism that reproduces in the bloodstream of its host and is transferred between hosts by insects like mosquitos. Different species of malaria live in different species of host animals. Lutz and her colleagues took blood samples from hundreds of East African birds, bats, and other mammals and screened the blood for the parasites. When they found malaria, they took samples of the parasites' DNA and sequenced it to identify mutations in the genetic code. From there, Lutz was able to perform what is called "phylogenetic analyses" to determine how different malaria species are related. In analyzing the genetic codes of the malaria parasites, Lutz was able to find places where the DNA differed from one species to the next. Then, the scientists used powerful computing software to determine how the different species evolved and how they're related to each other. 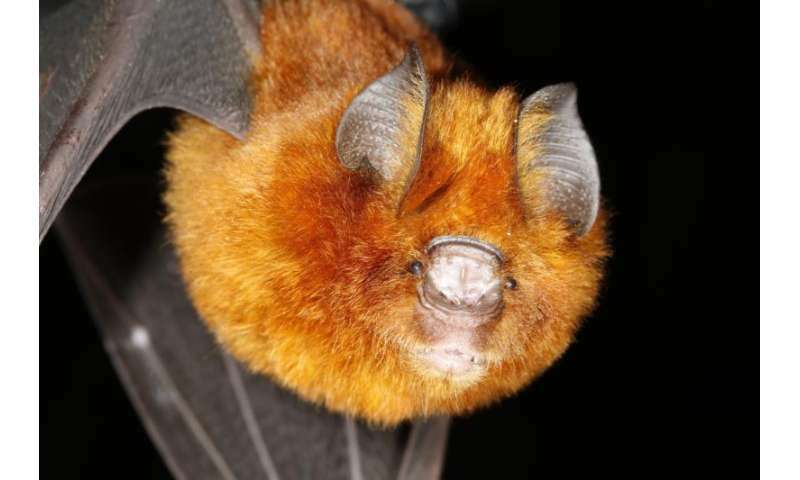 This phylogenetic analysis relied on large sample sizes and DNA from many different host species of bats and birds, because otherwise, the picture would be incomplete—"Trying to determine the evolutionary history of malaria from just a few specimens would be like trying to reconstruct the bird family tree when you only know about eagles and canaries," explained Lutz. "There's still more to discover, but this is the most complete analysis of its kind for malaria to date." 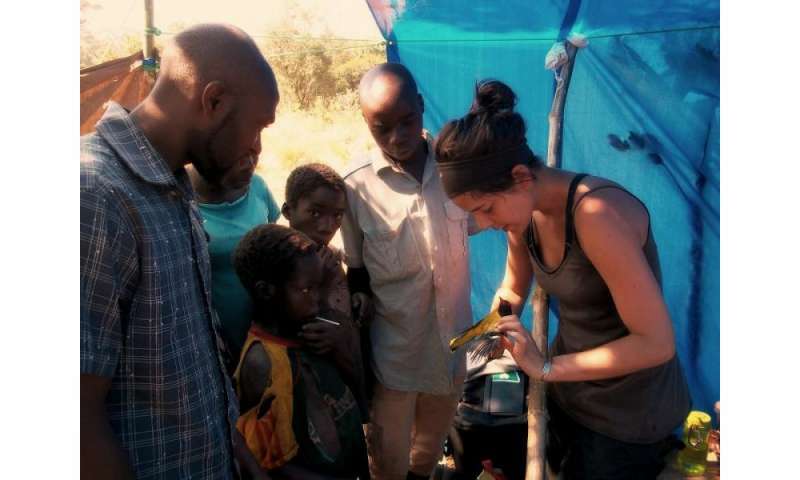 Lead author Holly Lutz showing local villagers a parasite that she found on an African black-headed oriole (Oriolus larvatus) in the camp at the base of Mount Gorongosa, in Gorongosa National Park, Mozambique. Credit: © Federico Pardo. The analysis revealed that malaria has its roots in bird hosts, from which it spread to bats, and then on to other mammals. But Lutz notes that bats aren't the bad guys here. "It's not that bats are spreading malaria—we get different species of malaria than they do, and we can't get it from them," explained Lutz. "Instead, by looking at patterns of mutations in the DNA of the different malaria species, we're able to see when it branched off from one host group into another. It started out as a parasite in birds, and then it evolved to colonize bats, and from there, it's evolved to affect other mammals." The study not only sheds light on the way the malaria was able to evolve and spread, but it also provides important information about the manner in which animals and their parasites are connected. "Each of these individual vertebrates is an ecosystem in and of itself," said Lutz. "In learning more about how parasites live within their hosts, who is infecting who, and how these organisms coexist in these living, breathing ecosystems, we can learn more about how they are connected to and affected by the natural environments that we share with animals and plants." And while the study doesn't have direct implications for malaria treatment in humans, co-author and Field Museum Curator of Mammals Bruce Patterson noted, "Malaria is notoriously adaptive to treatment, and its DNA holds a host of secrets about how it's able to change and evolve. Having a better understanding of its evolutionary history could help scientists anticipate its future."